Founded in 1971 to represent the Turkish business world, TÜSİAD is a voluntary, independent, non-governmental organization dedicated to promote welfare through private enterprise. On account of the institutions represented by its members, TÜSİAD has a significant representative capacity of the economic activity in Turkey in many spheres such as production, value added, employment and foreign trade. TÜSİAD’s activities are aimed at creating a social cohesion based on the competitive market economy, sustainable development and participatory democracy. Headquartered in İstanbul, TÜSİAD has a representative office in Ankara; international representative offices in Brussels, Washington D.C., Berlin, London and Paris; networks in China, Silicon Valley and the Gulf Region. 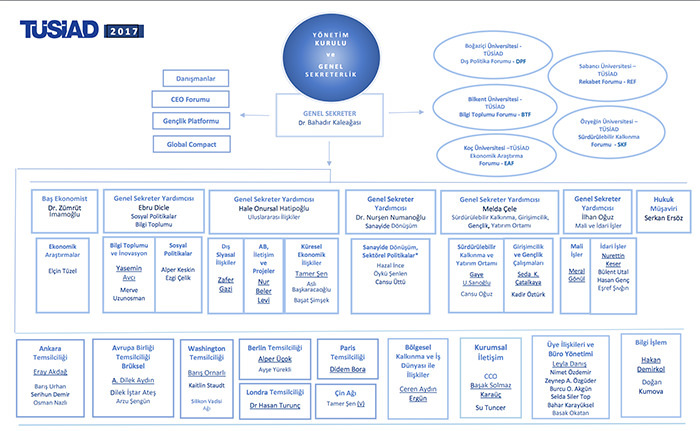 TÜSİAD is a member of BusinessEurope which is the leading advocate for growth and competitiveness at European level. All of TÜSİAD’s activities is carried out through nine Round Tables led by the members of the Board of Directors and 36 Work Groups organized within the round tables. These activities are pursued with the substantial support and contribution of the Secretariat General, Representative Offices, and University Partnership Forums. A voluntary organization of the private sector representatives and the voice of the Turkish business community since more than forty years, TÜSİAD carries the belief that Turkey will be a determining regional and global power, forward to the future. Contributes to the formation of national economic policies by correctly evaluating regional and sectoral potentials of Turkey's economic and social development, in an environment in which social peace and harmony are maintained. Participates in the global promotion of Turkey and supports the EU accession process through efforts to develop international political, economic, social and cultural relations as well as communication, representative and cooperative networks. Conducts researches, forms views, and develops projects and activities in the context of accelerating international integration and interaction as well as regional and local development. TÜSİAD aims to encourage and develop a unity of thought and action on behalf of the Turkish business world in line with these objectives through the direct and indirect dissemination of its views and recommendations to the Turkish parliament, government, other states, international organizations and the general public through the media and other means. TÜSİAD is a voluntary based civil society organization established by Turkish industrialists and businessmen in 1971 in order to represent the business world. 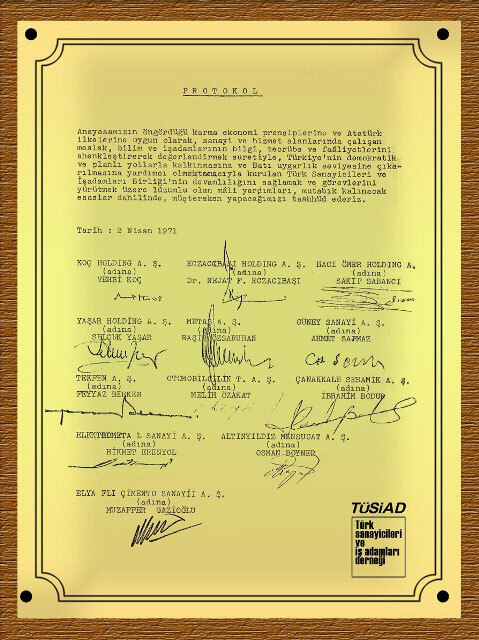 TÜSİAD aims to contribute to the formation and development of a social order based on the adoptation of the universal principles of human rights, freedom of thought, belief and action, a secular state of law, as well as the concepts of participatory democracy, a liberal economy, the rules and regulations of a competitive market economy and environmental sustainability. TÜSİAD works to achieve the realization of the main objectives stated above based on the belief that businessmen, working in line with the targets and principles of Turkey's reaching and surpassing the norms of contemporary civilization and holding to the equality of men and women in politics, the economy and education, comprise a pioneering and enterprising group in society. As the representative organization of the Turkish business world working for public interest, TÜSİAD strives to support entrepreneurial activities in conformity with the universal principles of business ethics; TÜSİAD constantly aims for progress and enhancement based upon continuous improvements in Turkey's competitiveness, social welfare, employment and productivity, as well as the country's capacity for renewal and the scope and quality of education and training during the globalization process. TÜSİAD contributes to the formation of national economic policies by correctly evaluating regional and sectoral potentials in Turkey's economic and social development in an environment in which social peace, compromise and reconciliation are maintained. TÜSİAD contributes to the promotion of Turkey in the global context and supports the EU accession process through efforts to develop international political, economic, social and cultural relations as well as communication, representative and cooperative networks. TÜSİAD conducts research, forms views and develops projects and activities in the context of accelerating international integration and interaction as well as regional and local development. TÜSİAD aims to encourage and develop a unity of thought and action on behalf of the Turkish business world in line with these objectives through the direct and indirect dissemination of its views and recommendations to the Turkish parliament, government, other states, international organizations and public opinion through the media and other means. Charter of Turkish Industry & Businessmen Association, 2. Article, "Aim of the Association"